The best way to shrink the cost of college is to apply to schools that will cut their price for the right students. About two-thirds of students attending private and public institutions receive scholarships and grants. There are other ways, however, to cut college costs beyond winning attractive financial aid packages and scholarships. 1. Select a school where you can graduate in four years. This might not sound too tough, but most students don't graduate on time. In fact, only 58 percent earn a bachelor's degree from a four-year institution in six years. Before committing to a school, check the four-year graduation rate of any school at College Results Online. 2. Get out of school in three years. Not many students have shown a desire to graduate from college in three years. College is too much fun to learn and dash. There are, however, schools that offer accelerated programs that allow dedicated students to finish in six semesters. Schools that offer these programs include American University, Lake Forest College, Ball State University, Manchester College, Hartwick College and the University of North Carolina, Greensboro. 3. Attend a school with a four-year price guarantee. During the current school year, tuition and fees jumped an average of 4.5 percent for private institutions and 8.3 percent for public universities. 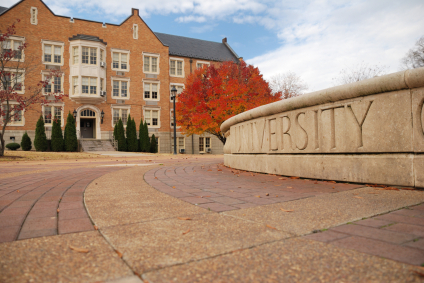 Some schools, however, offer tuition guarantee plans that promise the same rate for four years. Schools that offer these plans include the University of Kansas, Immaculata University, Capitol College, Columbia (Mo.) College and Sewanee-University of the South. The University of Colorado offers a tuition guarantee for out-of-state students. 4. Become a resident advisor. Students who are mature (or at least more mature than the typical college student) and blessed with good social skills, should consider becoming a resident advisor, who acts as a mother hen/cop for students living in dorms. RAs usually get their room and sometimes board for free. 5. Collect cheap college credits. Taking Advanced Placement and International Baccalaureate courses while in high school can shave off one or more semesters. Students can also obtain college credits through the College-Level Examination Program (CLEP), which allows students of any age to demonstrate proficiency in college courses. 6. Take community college classes. Another way to collect college credits is to take classes at community colleges. Students can start taking these classes while they are still in high school and continue the practice during summers when they are in college. 7. Consider free or nearly free schools. Work colleges provide a college education for a free or at a reduced tuition. You can learn more about work colleges, including the College of the Ozarks and Berea College, at the Work Colleges Consortium. Other schools that offer free or greatly reduced tuition include Franklin W. Olin College of Engineering, Deep Springs College and Cooper Union. Costs can start piling up even before you reach college what with college applications often costing $60 or $70 a piece. Free College Applications maintains a list of schools that offer free or reduced price applications.